This tactical procedure is very common in many games. As you might have guessed this procedure involves attacking two (or more) pieces or squares simultaneously. 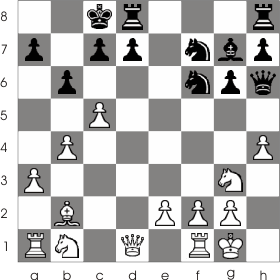 In a normal attack a player could defend by moving the piece, exchanging it or protecting it. The double attack has bigger chances of causing a weakens in your opponent's game. You can use the double attack in any phase of the game. Because the queen is the piece with the greatest range of action and mobility it can execute this procedure more easily than the other pieces. Checkout the following games to understand how to apply this procedure. In the next game it's Black's turn to move. With 1...Qe5! he attacks both the bishop from f5 and the rook from a1. But White has an escape; he can capture the knight at d7 with check : 2. B:d7+ and Black is forced to protect the king 2... K:d7 giving this way, his opponent the chance to move the rook 3. Rd1. This time White found resources to defend himself. In the next example White has its turn to move. From this position he has no way to perform a double attack. But if you watch more carefully you can see that he has this move: 1. Qb3. Now the knight at f7 is under attack; Black has to protect him somehow: 1... Rf8. The first's move purpose wasn't only to attack the knight. 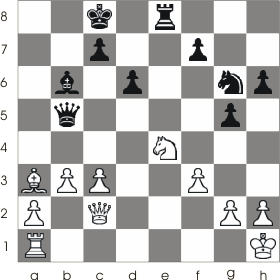 White wanted to bring the queen in such a position that he can perform the following double attack : 2. Qf3!. Now the queen threatens two places : the knight at f6(which is also attacked by the bishop from b2) and the checkmate at a8 so.. it's obviously Black will lose the knight. Observe how the first move didn't allowed Black to protect himself against the double attack because it forced him to protect the knight at f7. This tactical procedure can appear in the openings too. 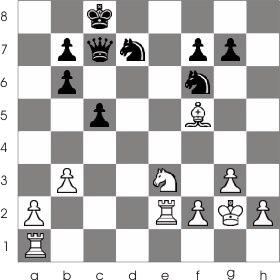 These are usual moves in the Sicilian Defense : 1. e4 c5 2. d4 c:d4 3. Nf3 e5. And now the position from the next example resulted. 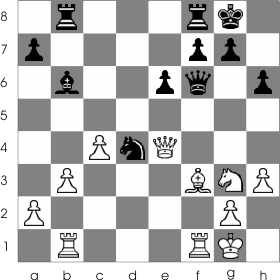 If you are not careful you might be tempted to capture the pawn at e5 with the knight. 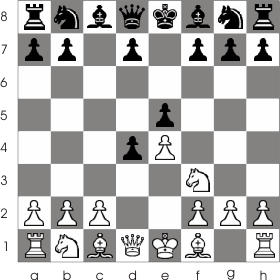 That would be a mistake because after N:e5 Qa5+ the queen attacks both the knight and the king with check. (So you are forced to protect the king and therefore you lose the knight). The double attacks performed by the knights can be quite astounding. In the next game White moves 1. Ba3:d6!. Black can't capture the bishop 1... c7:d6 because 2. Ne4:d6+ with check and multiple attack over the queen and the rook; and of course after the king is moved 3. Nd6:b5. You can also perform double attack with the pawns. In this case the double attack is called a fork. In the following example it's Black's turn to move. He currently has no possibility of a double attack. But that doesn't stop him from creating the possibility : 1... d5 2. e:d5 c:d5 3. Bb3 and now he is able to perform the fork: 3... d4 (the pawn attacks both the knight and the queen; White has to give up the knight). The double check is another particularity of the double attack. It's called double check because the king is being checked by both the piece which moved and the piece whose path was freed. In this case the king can be made safe only by moving it. It can't be made safe by capturing a piece or by placing a piece between the king and the attacker. In the game below Black performs a double check with Nd4:f3++ and captures a bishop. 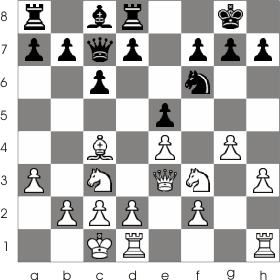 The king can only be made safe by moving it because both the bishop from b6 and the knight from f3 are checking it. This allows Black to perform the next double attack over the queen and the two rooks: Nf3-d2 forcing White to give up a rook. Black wins because he now has an extra rook.